A drawing’s better than my bad writing. I always criticize some anime like the Binbogami Ga anime adaptation for doing lazy namedropping references but I often do the same. Anyway, France has always treated Muslims living in it as third rate citizens, and ever since the Charlie Hebdo terrorist attacks it’s getting much worse. There’s been more islamophobic acts in January 2015 than in all of 2014. The map above’s from the 17th of January, I think the guy doing it just gave up on updating it as it stopped getting updated. The week of the 15th of January, a 47 years old man was killed as well, stabbed 17 times, with the islamophobic motive of his killer clearly defined. Some really aberrant things are happening too. At least three children so far have been placed under police custody or summoned to the police station for “terrorism apologia”. This week, a mother had her five children, two which she’s still nursing, taken away from her by the authorities, saying that her husband “is a radical and use violence on the children”. In the 0% chance that this is true, there was absolutely no need to take away the children from their mom, as she hasn’t done anything wrong. They also refused her when she wanted to bring her milk to the children in custody. The father was in Tunisia visiting his family when it happened, and he hurriedly went back home hearing the terrible news. If he was an actual “radical” and dangerous, they would have stopped him back at the airport anyway. The way they took the children away clearly shows the authorities’ current paranoia. On the other hand, I’ve been reminded we aren’t all stupid in France, as there’s many bookstores reporting since the Charlie Hebdo terrorist attacks that sales of the Coran have been going ultimate cosmo mugen no kanousei over 9000. A lot of people want to make their own opinion instead of believing everything massmédia says. Stuff like this makes me proud to be French again. One final point I also wanted to bring up. I know of the “the more afar a tragedy happens the less people feel concerned” journalism theory thing, but seeing it blatantly head on like that was pretty disturbing. 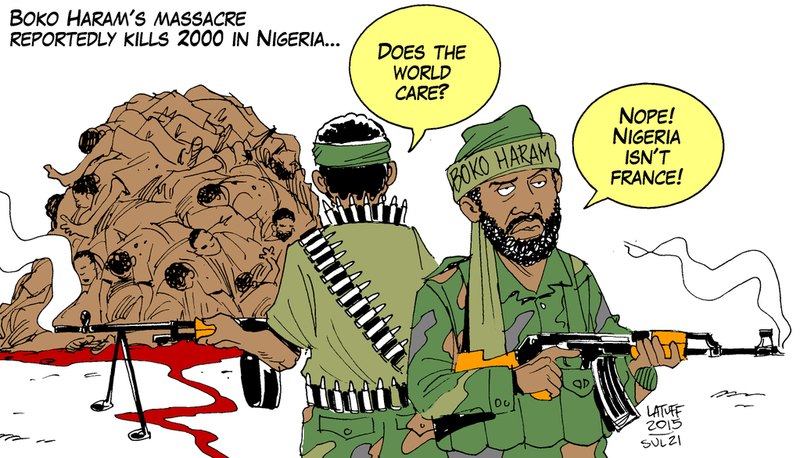 This drawing as well is by Carlos Latuff. inb4 I too get lifted for terrorism glorification using 2D skating little girls and mechas. Edit: Changed the name from charlie hebdo attacks to january attacks to remind it’s not only charlie hebdo that got attacked. 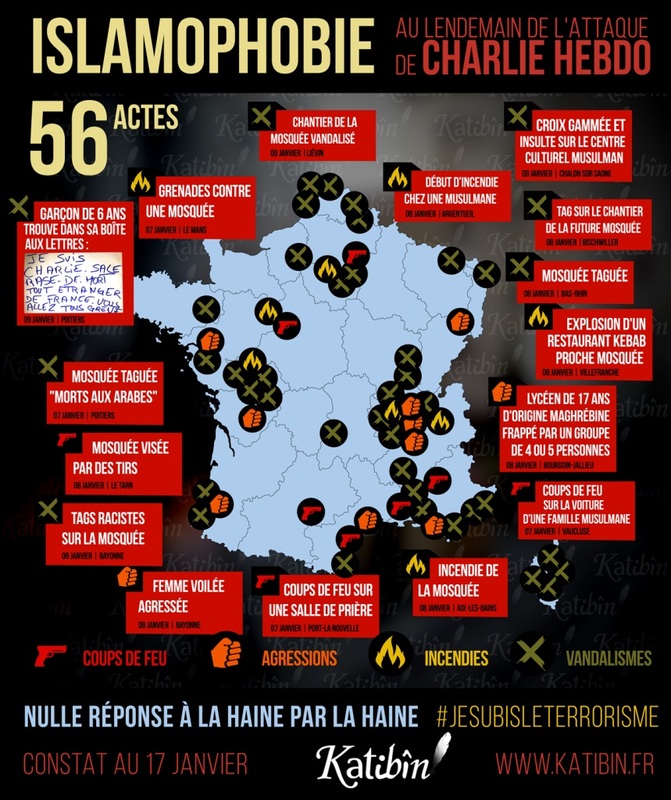 This entry was posted in Opinions on... and tagged #jesuisunevie, Charlie Hebdo on February 5, 2015 by rockmanshii. This is all sadly true. the media just gets some information then just makes up the rest because they have a hunch. Nigerians asked for it by being muslims. If assaults with wine bottles and baguettes became a thing in Abuja more people would care. Mondai-Ji-tachi ga Isekai Kara Kuru sou Desu yo?